This week, SocialMediaToday.com reports 5 New Facebook Updates and Tests Spotted This Week. Number two on the list is a new ‘Events’ icon on the mobile app navigation. This is a limited test for some users. In addition, some users are reporting seeing a new ‘Groups’ icon on mobile. It’s interesting to see Facebook test a fifth icon on the nav bar, clearly looking to see what’s popular with users. Also, I enjoyed this article with highlights from Facebook COO Sheryl Sandberg’s recent talk at dmexco 2017 in Cologne, Germany where she reveals three steps to success on Facebook for businesses of all sizes. In July Facebook began giving brands the ability to create and manage groups using their pages. Groups, when done well, offer pages a way to have meaningful conversations with their audiences in a more controlled environment. What two areas are the most important for group success? Moderation and content. If you have ever posted something publicly on Facebook that you meant for your friends only, you know how embarrassing that can be. The first step to keep that from happening is to learn about the privacy settings available. Once you know how to protect your information, customize how your profile appears to others. It’s a small time investment that can save you from awkward moments. Content that entices readers to click has certain key elements—regardless of the network. The headline, the visuals, the language, and more! Join me LIVE on my Facebook Page for this 4-part series brought to you in partnership with BeLive.tv! 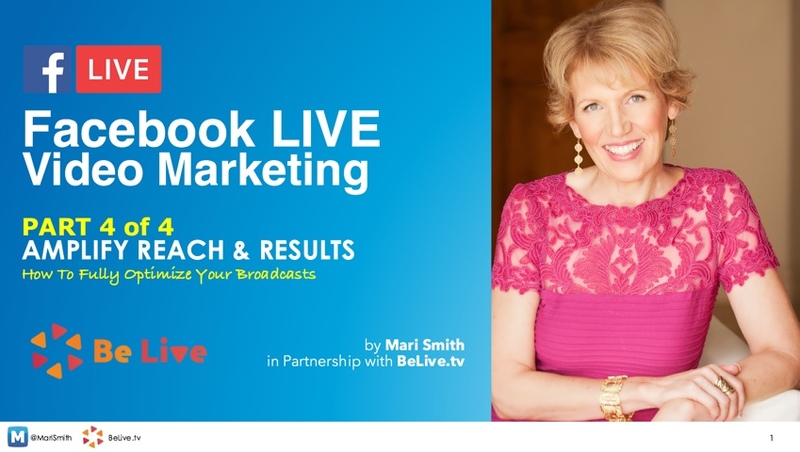 Each Thursday at 12pm PT / 3pm ET / 8pm UK, I’m leading a packed training session with top tips, strategies, examples and helpful ideas to get you started with your monetized Facebook Live show! On a personal note, I’m on a plane flying from Austin, Texas back home to San Diego, California just now. I’m delighted to be back on the road and enjoying my speaking engagements again, after focusing on my health throughout the summer. I’m loving my new lifestyle as a vegan (first time traveling as a vegan and it just takes a bit of extra prep & always packing your own eats on the plane!). Feeling superb and ready to take on the world, ha!